Sam is a quiet man most of the time. He has many friends though a majority of those are actually the clients he's had over the years. He is easily approachable and seldom, if ever, gets angry. Sam is the only child of Bucky Davis Thornbody and Samantha Elaine Quillby, but he was raised by his uncle, Aaron Miles Quillby, when his father passed away overseas while Sam was five years old. His mother, devastated by her husband's passing, emotionally shut down, neglecting Sam from that point on, which forced Aaron to step in and raise him. Aaron had managed to persuade Samantha to, at least, enroll him in self-defense classes to protect himself, which she agreed to do, though it seemed she did nothing more for him beyond that. Sam was born and raised in Atlanta, Georgia. He attended school there but made very few friends, due to his feeling socially awkward around people as a cub, and usually preferring to be left to his reading. There was one other classmate that managed to break him of his silence, namely Kara Taylor. With the aid of his new found friend, Kara, as well as his guardian, Wheeler, Sam found himself opening up to people a lot more. Sam eventually began giving advice to the new friends he made as a result of his calm and relaxed nature. His studious habits allowed Sam to advance through his schooling much faster than his other friends, allowing him to finish High School a full year earlier than most of them, at age 17. During this college years at Marshall University in Huntington, West Virginia, he also further developed his friendship with Kara and married her at age 22, shortly after finishing college and getting his degree as a therapist. One of his first major clients had Sam traveling out to The Big Island later that same year, where his wife also gave birth to their son Bobby. Sam, Kara and Bobby stayed in Hawaii for approximately five years before ultimately moving to Huntington when Sam was no longer needed there, as it seemed he was always getting clients from that area. Sam lived in Huntington with his wife and son until around age 33, when another major client forced Sam to uproot his family to move to Georgia. This also was to lead to a divorce, owing to the fact that Kara had a medical need to be in Atlanta, where she was born, due to a disease called Clinical Homesickness. While in Georgia, however, it was discovered that Bobby also suffered from the disease, which meant there was an urgent need to get him back to Huntington. This left Sam with a dilemma, as he still had a client to tend to. This client, though, later discovered the problem with Bobby, and freed up Sam to allow him to go home without restricting him. It was originally determined by Sam and Kara they would get a divorce, but neither could actually go through with it, seeing the pain it caused their son. As a result, the two would stay married, but simply live in two different places: Kara in Atlanta, and Sam and Bobby in Huntington. Bobby hated this idea but accepted it, as he really didn't want his mother ill.
Sam, at that point, vowed to his son that he would never force him from his home again, and began working in a more permanent location from that point on. Sam remains a relatively calm person, but in moments of weakness, such as the times he thinks too much about the his wife or any time Bobby gets seriously injured, Sam will show his emotional side. Sam's fur is a tan color, with his quills, headfur and paws being a slightly darker brown, and also has sky-blue eyes. 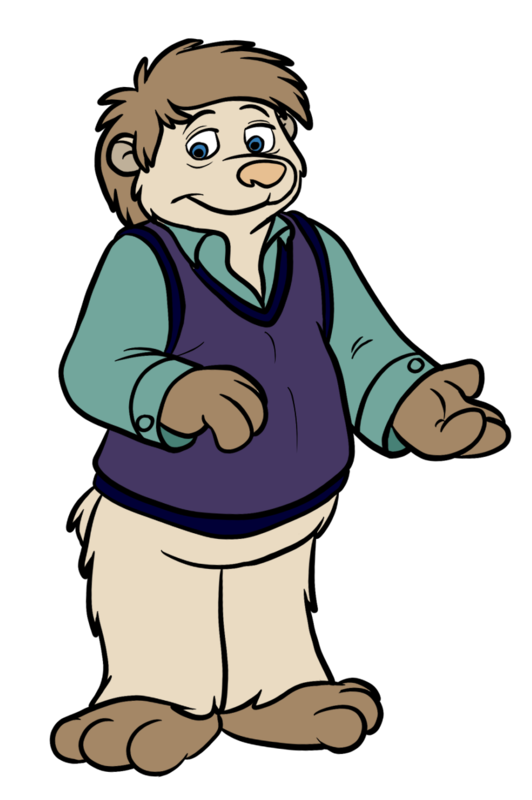 He is usually seen in a light blue long-sleeve shirt, which is often accompanied by a purple sweater-vest.